You can't call yourself a Marist student until you've eaten one of these sandwiches. What is it that keeps driving college students back to Rosticceria Rossi and Sons? If you’ve never been and are looking for an amazing place to grab a sandwich, Rossi’s is the place to go. It’s a family-run deli that has been around for 36 years, with sons Fabio and Roberto. Starting off as a small deli, Rosticceria Rossi and Sons has built a name with their reputation for excellent sandwiches and deli food. With the arrival of social media, the landscape of Rossi’s business has really changed. “We see new faces every week,” says Mauro Rossi. A recent Buzzfeed article named Rossi’s 1 of 16 college town foods worth skipping class for, and we definitely agree. When class is in session, students make up at least half of the dining crowd at Rossi’s from Poughkeepsie’s 3 school: Marist College, Vassar College, and the Culinary Institute of America. Rossi believes that Marist College students make up 70 percent of their student customers with the other 30 percent coming from Vassar College and the CIA. In addition to serving the college crowd, Rossi’s also caters local corporate lunches and other seasonal events. When dining in or ordering take out from Rossi’s deli, I recommend any of their paninis. Everything is fresh and made daily. “Home made is how we do things here. We are a family run business, so at Rossi’s we can make anything you choose,” said Rossi. 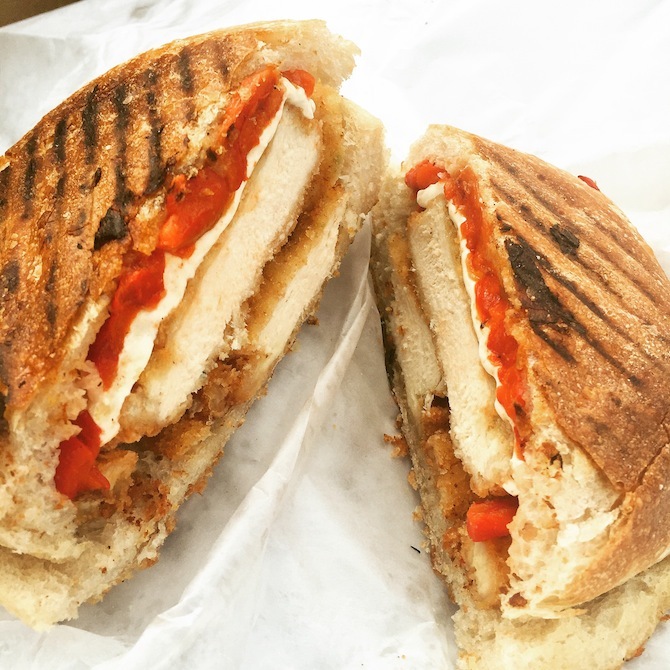 According to Rossi, the best-selling sandwich by far among Marist students is the breaded chicken cutlet, with fresh mozzarella cheese, roasted red peppers and basil pesto on your choice of bread. My personal recommendations are the chicken cutlet with their home made vodka sauce on freshly baked focaccia and their Italian combo on a semolina roll with sesame. There is something about their bread that keeps us coming back for more. With Focaccia the size of your face how could you not enjoy the sandwich? The next time you are feeling hungry, head over to Rosticceria Rossi and Sons and discover the culinary delight of one of Poughkeepsie’s oldest and tastiest Italian delicatessens. I know you’ll become a loyal fan as soon as you take your first bite. What Famous Manhattan College Deli Are You?